Pink knockout roses will require 6 hours of full sun to do well and flower a lot but they can take less you get less flowers. Just keep an eye on them the first year to see that they don’t burn. The first year is always the trickiest because you want the young plants to make good cane growth. Then when they harden off for the winter, there will be no trouble with the sun the next summer. If you see them burning, it looks terrible, simple throw wet newspaper over them in the first 6 weeks after planting them and keep them well watered until the new feeder roots can take the water up themselves. Again that takes about 6 weeks. I wouldn’t fertilize them if they are going to be a very hot sun as this could burn them. Put some rose goodies in the hole to feed them such as compost, a bag of steer manure and 1/2 cup of bone meal for the roots to munch on. Next spring continue to fertilize and water so they don;’t dry out next the warm bricks. The roses you mentioned are all good roses. I have Souvenir de la Malmaison, it seems to bloom a lot only in the spring. Old Blush is pretty but to me, not really good in form for cut roses. New Dawn, is very pretty and from what I’ve heard has good repeat bloom. I have First Prize climbing, but the problem with climbing hybrid teas they usually don’t repeat much after the spring. There is a sport of New Dawn that is pinker called “Awakening”. Another beautiful climber you could consider is Devoniensis, pink in bud, white when fully open. 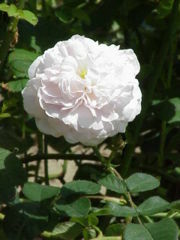 I have Madame Alfred Carriere and it is a monster, very large and usually has at least some blooms all year round, but it is white. For pink climbers, I would pick Elie Beauvillain, a noisette/tea or Parade, hybridized by Gene Boerner – the master hybridizer. They are both repeat blooming. Both these roses get up to at least 15 ft.
You could purchase any of the roses I recommended on the Antique Rose Emporium website, or you can do a search or check on the Help me Find Roses website for other web sources of these roses. But if I were you, I would get Elie Beauvillain. Teas and Noisettes do very well in our area, and it is a cross of both. I have three yellow rose bushes spread out throughout my garden. The past 4 years, along as I have had them, they have produced beautiful yellow roses. This year, one of the bushes is producing bright pink roses with no hint of yellow. Roses are like human beings and have blood lines. When a breeder is looking to bred a new rose they select the roses from other roses blood lines and then mix them. There are enough roses that go into making another. A new rose that would fill a legal size page. What has happened to your rose is that it has sported to one of the roses in it’s background. Usually though it is only one flower that sports. 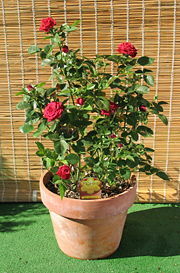 You can always go on the internet and look up any sites that you can find about roses. If not then you can just go to your local green house and ask them questions on your roses. But you should be happy that you got your roses to change color without having to go out and buy a different color roses. I know that that might sound bad but a lot of people that want to try and change there color of roses don’t always get the color that they want. So they end up having to spend more money on roses just to try and get the color that they want. But your roses do sound like they are very pretty and hope that you will enjoy your new roses.